As I’ve gained fitness through running, I’ve had many opportunities to interact with others about this journey. Usually this is in the realm of answering training questions and offering encouragement to those who tell me that they too would like to begin running (or be more active or lose weight). I love helping people! That’s, I think, part of my call as a pastor. I’ve discovered that better physical fitness can be related to spiritual fitness. Or better expressed, taking care of our bodies is part of a holistic way to live our faith. For me personally, I’ve discovered that running allows me to meditate, to pray, to reflect on life, and even to write sermons. These benefits come from those, long and short, solitary runs. Another benefit is the community that I’ve discovered by joining a running club. I value the relationships that I’ve built over the last couple years. One of my favorite activities is Wednesday night track…it’s hard work (which I like) but more importantly it is gathering to work hard together. Its social and I like that. With the added benefits of my husband and adult children becoming runners as well, it’s become an integral part of my life. All this has nudged me towards coaching. At first I thought this was something to do in addition to my work as pastor. But I’m learning that it is somehow part of my pastoral call. Of course I’m still working this all out, but helping people to move…to get moving…to experience the wonderful bodies that God gave them. It falls under my call to provide pastoral care while also witnessing to the Kingdom of God in the community. Something that I’m also trying to work out is how I can help other pastors to be more proactive in their own self-care. This book is for coaching athletes but it can benefit anyone who is “in the business of motivating other people.” So far the introduction has reminded of the importance of trust. It is critical for leadership, in and out of the church. In the church we talk about trust in God…something very important to the life of faith. I want to explore the importance of extending that trust in God into trust of one another (including trust of the pastor/leader). I plan to share more insights as I read this book. Meanwhile, what are your thoughts regarding the intersections of coaching, trust, and faith? This morning I heard the phrase, “deliberative practice” as the means to performance improvement. The idea seems logical, but I wonder how often we are actually deliberate in our practice of whatever it is we want to improve upon, or skill we want to acquire. I have two examples, one bad the other good. I’m sharing some kind of story on my last day of Spanish school…this trip to Cuernavaca was in 2013, it’s definitely time to go back! The bad example is that I have not been deliberate in my working to improve my ability to speak Spanish. I tell myself, often, that I will dedicate so many minutes or hours per day to this activity yet I fail to follow through. It is so easy to find other things to do, especially when your accountability is only to yourself. Of course the good example is found in the success I’ve achieved at running. When I first started I was doing this entirely on my own. My accountability was to myself, and yet it worked initially. 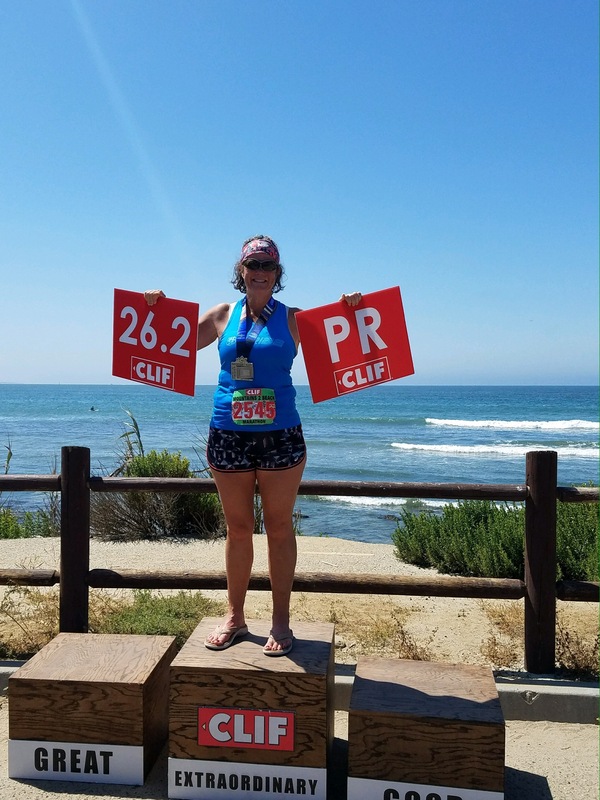 I was able to build mileage and to run my first half marathons and even a full marathon. But I wasn’t as successful as I could have been. I wasn’t running at the best for me paces ,or doing the best for me workouts, or even putting in the best for me mileage. This photo was halfway into a 20 mile training run for my 2nd marathon. My husband was nice enough to accompany me on his bicycle. My first marathon was so hard that I immediately wanted to try again…to do better. So I signed up for the LA Marathon and started training. But I never ran that marathon. To this day it is the only race that I’ve signed up for but didn’t do. Why didn’t I do it? I wasn’t ready mentally, and most likely not physically either. The weather that day was forecast to be hot (as was my first marathon) and this forecast raised such a level of anxiety in me that I couldn’t do it. I didn’t even go to the expo and pick up my shirt and bib. A month after this I joined a training program and my running has improved steadily. There are lots of post here about that improvement such as, That’s a goal! The improvements came through deliberative practice which came through coaching as well as the support of a running community. It all works together, especially when training is hard. We benefit when we have outside sources to urge us along and to hold us accountable. An example. Last winter we had an incredibly windy week. I did a short run in the wind. It was so bad that l the sand stung my calves, while I also felt as if I were pushing a giant bolder into the wind. A few days later I had a long run (15 mile progression) scheduled and decided that I should postpone this run for a few days. Until we had better weather. I was sure my coach would agree with this. Not! I mentioned the idea and he promptly responded, no, just change the workout. Instead of a progression, run hard into the wind for the first half and coming back will feel easy. Ok. I did it, and was pleasantly surprised with how well I did it. A deliberative effort that would not have happened without a coach to push me. We all need those people in our lives who can help us to know when to push and when to hold back. Sometimes its a coach and sometimes its a great friend or mentor. Of course, before we can begin a deliberative practice we need to know what we want to do, what we want to achieve. But then I think its important to realize that achieving success will be much more probable if/when we work with others toward that goal. As I think through this, I’m realizing that I need to build some sort of accountability system and community to work on my Spanish! If you’d like to start running and want the accountability and training help of a coach let me know! An indication of integrity is to respond truthfully. A sign of decency is to respond with gentleness. These types of responses may not be easy, especially when the person standing before you has just expressed a crazy, seemingly unrealistic goal. I’ll remember forever my first conversation with Josh Spiker about coaching. I had recently completed the Ventura Marathon with a time of 5:04:36. This was an improvement of about 45 minutes from my first marathon. How did I improve so much? I attribute hard work and participating in a group training plan through the Ventura Marathon and Josh. Some time after this we had another conversation at track when he playfully asked, “What about 4:05? Would you be happy with that?” Yep…if it gets me to Boston! Mountains 2 Beach was yesterday. I ran a 4:04:49! I’m going to Boston! I still hope to get at or below 4 hours. Meanwhile I’ll enjoy this feeling of accomplishment knowing that it wouldn’t have been possible without good coaching. Thanks Josh!